A macroergonomics approach builds a program that is holistic, strategic, and built to last. If an organization doesn’t have management leadership, the program will fail. Similarly, if there’s scant worker involvement, again, the program will fail. By incorporating and empowering all members of the organization from the onset, it can yield more impactful and longer-lasting solutions to workplace injuries and overall job satisfaction. 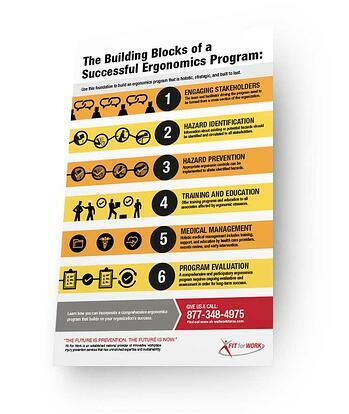 Download our printable infographic to learn how to implement a successful ergonomics program.